The United Nations Framework Convention on Climate Change has announced that the Paris Agreement will enter into force on November 4, 2016. With 85 countries on board, the announcement marks the first time in history that a significant portion of the international community has legally pledged to work together to combat the threat of climate change. While still a controversial topic, the Intergovernmental Panel on Climate Change sites strong evidence that the temperature of the earth has increased 0.85° C since the Industrial Revolution. The Paris Agreement seeks to prevent this increase from reaching 2°C above pre-industrial levels, and eventually limit the increase to 1.5°C. To achieve this goal, participating countries have promised to take proactive measures toward curbing global warming, most notably by setting aggressive targets for reducing greenhouse gas (GHG) emissions. Although the debate continues about whether or not global warming is caused by human activity, manmade GHGs have been shown to collect in the atmosphere and prevent heat from escaping at a natural rate. The Environmental Protection Agency reports that carbon dioxide emissions alone have risen nearly 40% since the Industrial Revolution. Other GHGs produced by humans include nitrous oxide, methane, chlorofluorocarbons and hydrochlorofluorocarbons, all of which trap heat in the earth’s atmosphere. Many scientists worry that a continued increase in global temperature will contribute to dramatic climate shifts around the world, including but not limited to more hurricanes, droughts, heat waves, melting glaciers and changes in sea levels. Since the world is a carefully balanced ecosystem, unnatural changes like this could adversely impact wildlife, agriculture and habitats. With the Paris Agreement officially underway, it’s safe to say that limiting GHG emissions is widely considered the single most effective measure to suppress the threat of climate change. But the battle is far from over. The next step is determining the most viable methods to reduce GHG emissions. In 2007, world-renowned consulting firm McKinsey and Company produced a global study of the size and cost of various methods for reducing GHG emissions. Entitled “A Cost Curve for Greenhouse Gas Reduction”, the report analyzed the significance and cost of numerous available measures, including upgrading lighting systems, transitioning to energy-efficient transportation, utilizing wind and solar energy, and many more. In 2011 the Department of Energy produced a presentation entitled “Window and Envelope Solutions for Today and Tomorrow”. 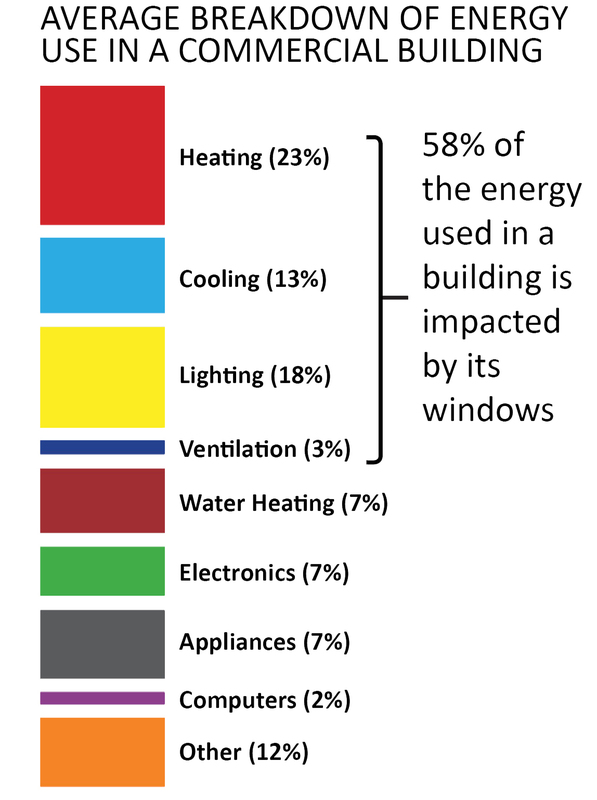 According to the DOE, 58% of a building’s energy is impacted by its windows, accounting for almost 14% of the total energy consumption in the U.S. In concert with the federal government’s efforts to conserve energy and reduce GHGs, Thermolite, Inc. is currently working with the Environmental Protection Agency, the General Services Administration and the Department of Veterans Affairs to improve the energy efficiency of several federal buildings via patented retrofit window technology. Unlike traditional replacement windows, Thermolite’s retrofit system is installed on the interior of a building’s current windows, creating a gap that traps air between the glass panes to mitigate heat loss. These windows utilize argon-filled low emissivity glass (Low E), which further seals the building envelope by minimizing the amount of infrared energy that can pass through the glass without compromising the amount of transmitted visible light. To evaluate the energy savings attributed to Thermolite’s retrofit window system, the facility staff at the Jacob K. Javits Federal Office Building contracted with an independent engineering firm to conduct a thermal analysis using advanced computer simulation software. The report concluded that Thermolite’s window system increased the R-value of existing windows from <1 to 3 – more than tripling its thermal performance. The building’s ownership estimates that the new window system will result in more than $1.5 million in annual energy savings. 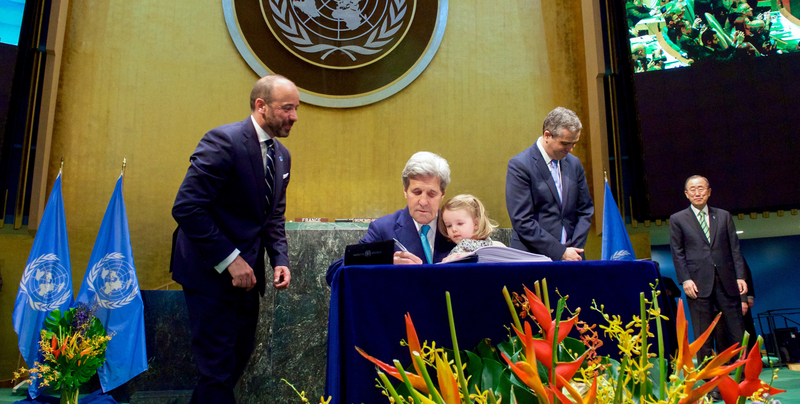 The ratification of the Paris Agreement is a milestone in the fight against global warming. That said, reducing the increase in the earth’s temperature to 1.5°C above pre-industrial levels will likely be an uphill battle for the United Nations. After all, fossil fuel energy is cheap, available and convenient. Perhaps in the future renewable energy will be a more viable option to reduce GHG emissions, but at this point in time it’s simply too expensive. By all accounts, conserving energy seems to be the most cost-friendly measure to curb global warming. Based on data by the Department of Energy, improving the insulation in existing buildings via energy efficient windows would reduce U.S. energy consumption by up to 14%. That would be a significant reduction in the country’s total GHG emissions, and a momentous step toward achieving a sustainable planet.